Most people know in a general sense what condensation is, and some may even have an understanding of its cause given their experience and perhaps a recollection of high school science. These same folks may also know that there is a connection between condensation and the terms “dew point” and “relative humidity,” but that is usually where most people’s knowledge ends. Unfortunately, a lack of understanding of these terms and the science behind them can cost homeowners thousands of dollars from the damages resulting from condensation. Simply put, condensation occurs when water vapor, a gas, changes into liquid water. Scientists and engineers refer to this as a “change of state.” The temperature at which the change from water vapor to liquid occurs is called the “dew point.” The dew point temperature is not static but varies depending upon the amount of water vapor present in the air and the air’s temperature. Relative humidity is the ratio between how much water vapor the air can hold and the actual amount present. The air’s capacity to hold water vapor is directly dependent upon its energy which we measure as its temperature. The higher the air’s temperature the more water vapor it can hold and vice versa. Therefore, if the air at a given temperature is only half filled to its capacity with water vapor we would say that the relative humidity is 50 percent (%). In the illustration below, the cylinders represent the air’s water vapor retentionon capacity while the blue represents the actual amount of vapor present. When the air loses energy (cools) its capacity to hold water vapor is reduced, but the actual amount of water vapor present does not change. This decrease in water vapor retention capacity while the water vapor amount remains unchanged results in an increase in the relative humidity as illustrated in the following. In each of the examples the relative humidity rose even though the actual amount of water vapor remained the same because the air’s capacity to retain it diminished. The dew point is that temperature where the air is filled to its maximum capacity with water vapor and thus its relative humidity is 100%. Therefore it is influenced not only by the air temperature but also by the amount of water vapor present. Whenever the air’s capacity to hold water vapor drops sufficiently or the amount of water vapor increases so that the relative humidity rises to above 100%, condensation occurs. Adding more water vapor or decreasing the air’s capacity to hold it, or both, will produce a change in state for the excess from gas to liquid. How does this affect a homeowner? Condensation can occur at the interface of any location in a home where warmer and cooler elements come into contact. These conditions can occur any time of the year, but some are more common in winter months. The homeowner’s attic is often a prime candidate for condensation which in turn can cause substantial damages because of resultant wood decay, mold growth, ceiling staining and other related problems. In an attic warm air from the occupied areas in a house rises naturally until it encounters the cool underside of the roof. Condensation occurs because the air’s capacity to hold water vapor is reduced where it encounters the cold roof sheathing. In most houses this can be prevented, or lessened, by quickly expelling the air to the outside before condensation can occur. Effective attic ventilation is often the key to prevent this problem. In some cases however, even good attic ventilation may not be enough because the quantity of water vapor is so great. This often occurs as the result of a flooded crawlspace, although any source of excess moisture can be the culprit. Homeowners are usually oblivious to the problem, but sweating windows and toilet tanks, and condensation on glasses of ice water in winter, often give clues to the problem’s existence. The drying of crawlspaces and installation of a vapor barrier there is the common solution to this problem. Perhaps the most damaging and expensive problems occur when a structure’s vapor barriers are improperly applied. 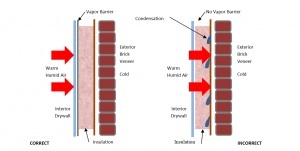 As illustrated below, in temperate climates the vapor barrier in the exterior walls should always be placed nearest the warm area followed by insulation. This prevents warm air from reaching into the wall and then condensing. When this scheme is not followed or no vapor barrier is present, the warm air will pass through the wall until it encounters the cold interior surfaces of the exterior sheathing, resulting in condensation. Over time, the resultant hidden decay and mold can literally destroy a home’s value. Summer months can also produce condensation problems for homeowners. A common problem in many parts of the country occurs in older homes that have been built over a crawlspace. No problems may occur for many years but then almost suddenly decay begins destroying the first floor’s structure. The culprit is once again condensation that occurs because the homeowner has begun air conditioning a home for the first time. The house was likely constructed without under-floor insulation and an adequate vapor barrier in the crawlspace. Humid summer air enters the crawlspace and then encounters the newly cooled underside of the floor causing condensation and decay. In time the entire floor structure can be compromised. Wet crawlspaces exacerbate the problem. Homeowners don’t need to monitor the dew point and relative humidity on a daily basis to protect their property. However they should understand the concepts related above and then use this knowledge to examine their property and make improvements that will prevent or mitigate any chronic condensation problem they uncover or suspect. for Sharing This Article Along with Their Expertise! This blog post was originally published by DONAN Solutions on February 17, 2015 and then shared with DISASTER411 on March 6, 2015. Vanessa Dahm is the Regional Sales Manager for DONAN Solutions in AZ, NV, NM, MO, & KS, and can be reached at (800) 482-5611 Ext. 1339. If you are an emergency service provider, disaster restoration contractor, or property insurance claims professional and also wish to contribute helpful content to this site then please call DISASTER411 Media at (855) 515-0411 or Contact Us. DONAN’s Lightning Investigation is now HVAC Forensics!